Hello Techbmc fans, today I bring to you Solutions to Android device system Overheating problem that has almost ravaged most of our Mobile smartphones tablets especially Android devices. Our guide in this post regarding to the problem at hand with our Android devices, will cover the fixes or solution and preventions of Android overheating issues. Before going into the main solution guide, here are main Highlights of actions or Kind of Android Device usage or exposure that leads to most Overheating Problems we get during the course of usage. Letting you know about it, will help to know how to prevent the issues. So overheating, shutting off and unauthorized automatic reboot of Android phones are always noticed after Android Root, Changing of the device follow come or official recommended Battery, Charging the phone with wrong charger, overuse of WiFi, Hotspot and internet connections while watching movies with apps like TV apps, online video watch apps like YouTube TubeMate etc, continues usage even after warning alarm alert message, running tunneling VPN apps for free browsing cheats, apps like Tweakware, Sypon Shield, Psiphon Handler, box app, Psiphon A+ Pro, QueenCee, droid razr and Netify. Running too many applications on background or on minimization, playing music and same time snapping of pictures with your camera, playing games while charging your phone, using of mod, crack and hacking apps, sometimes, due to wrong processes, steps or procedures taken during Android update/upgrade. Storage memory filled, both SD card and internal memory (ROM), which can also lead to slowness in system’s operation or functioning thereby causing overheating. Exposure to direct sunlight, fire or hot weather conditions (temperature). And many more which you can think of it being the problem. 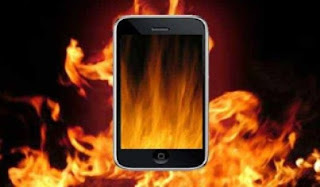 You should know that putting an end or prevention of your device from overheating is a paramount, because during the course of heating, the phone radiates bad rays which are harmful to human health, as it kills some cells in human body thereby causing some dangerous illness like cancer. This is also applicable to Desktop laptop/PC devices during overheating. That’s why it’s not advisable to carry laptop on your laps especially the masculine genders (Male) because it kills the sperm cells according to Expert Health Practitioners. Now, in order to prevent or stop your Android devices from overheating, just follow the below detailed tips meticulously. Getting a pack or case for your new and old smart android device, will go a long a way in protecting the phone from exposure to hot temperature and as well as it protecting you from the bad rays emitted out from the device when exposed to bad weather conditions. Ensure to get a case that will allow the gadget get the air it needs in order to stay cool. I will suggest you should go for a non-leather based pack/case so as to let the device get the air it needs. As said above, there are apps that turn your Android device CPU into heating oven and these are notorious apps that contain viruses and malwares. Also, there are some that helps to minimize the heavy loads or task given to a mobile device to carry out which are helpful. In order to attack and protect your device from such viruses and malwares, you are advised to download and install Anti-malware or Anti-virus applications, so as to screen any strange or unsupported app you want to install without knowing it contains something that will make your device not to be safe. The apps regarded to contain viruses, may be as a result of bad development by the programmer or App developer. And when such bad development isn’t taking care of and you get it installed on your phone, it results to getting the device’s CPU and battery extremely hot. Having too many apps running on background especially, Android phones with low Random Access Memory (RAM) tends to make the CPU heat extremely. For example you are browsing and same time chatting with different social media chat apps like Whatsapp, facebook, twitter, telegram, skype, instagram messaging chat apps, etc on same phone. What do you expect of the device; certainly it will get so hot. Even most of the latest android smartphones with larger RAM size are also facing same issue but through lots of services that takes up CPU resources and pressure gotten from background apps. If you can reduce too much of running background apps closing the apps properly after use, then your device’s hardware will be far from heating up. In order to stop your device from heating because of background apps, then you need to look into your already installed apps if they are set up to auto-start when you boot your phone or close them from running on background after utilization of what they got to offer you. In order to switch off some auto start apps if your device supports it, just go to your phone settings and locate the option. Ensure to set it very well, also there are apps that can help you monitor auto start up application, get them and set up your device to be standard. You can as well, check out and also put an end to apps utilizing or consuming much of your RAM via Settings >> memory, uninstall them if you like. It is now well known by most users of android that features like Mobile data, Wi-Fi, Hotspots, GPS and Bluetooth Connections are major factors that drain the power of your device’s battery. And most of us doesn’t care or want to find out why it is so. The embedded services in talk, drain up your battery so fast because they need a lot of power to carry out functions. Because they need more power from the battery, so the battery tends to serve more extra power in order to maintain the connections especially, for Wi-Fi connection. And continuous serving of extra power repeatedly for a good period of time due to usage by the user tends to get the temperature of the device so high. Also, utilization of Google Maps and different comparable applications tends to get your device overheat as well. Apps like Google maps heats up your phone because it requires GPS connection and screen display to stay active for long duration. Leaving Bluetooth and mobile data for long without switching off also gets your android device hot. So ensure to prevent long time duration of these connecting services. Even if you intend using any of them for a long duration of time, do not run too many apps on background. Utilization of Android games and digital camera with Virtual Reality also gets your device hot. Games are not just like other apps, they are such that are intensive on the resources and involved in putting extra stress in the CPU and also battery. When you keep your camera active or on for a long duration of time, may be is in use for covering videos, the more it stays active, the more power or energy it requires from the battery. And once the battery heats up, note that, it has affected the CPU already. For VR, it happens to be one of the recent things that make your device gets hotter than baking oven. It isn’t bad to utilize your device with a VR gear, however using it for a long time duration produces excessive heating. So ensure to reduce usage to avoid excessive heating. Some android phones selects charger when charging them, make sure to charge your device with the right charger you bought it with. Original charger that was manufactured by the producer of the smartphone you are using happens to be the best and compatible tool for increasing the energy/power of your battery. They produce chargers based on the voltage supply and the temperature of a particular device. So when you use another specified charger for another device produced with distinct voltage or current supply capacity, it tends to expose your phone to overheating and sometimes leads to device explosion. Charge your phone properly, don’t be the type that plug phone on light and same time using the device, doing that gets your Android overheat and exposing you to health risk. Do not put the phone in a hot area or covered while charging it. Ensure to expose to air while charging. >> You can check your smart Android phone battery information free by dialing this USSD *#*#4636#*#* if the battery status is not good enough, do well to change it. >> How To Detect An Original Charger Meant For Your Mobile Phone And The Rate At Which The Phone Charges With Different Chargers. Reduction of your device screen Brightness Display, tends to enable your device stay cool. It doesn’t cause much of heating, although it drains your battery thereby causing it to heat. So set up your device’s brightness display to a normal degree or temperature so as to enable a better performance of your device. >> Download And Install Apps That Monitors, close background apps and Cool your Phone’s Temp. There are so many Android Apps for monitoring, control of gadget’s temperature and as well as closing apps running on background so as to enable a better performance of any android device and prevention of overheating. These apps can be gotten from Google play Store. The apps goes a long way to see that your Android device gets better in functioning. Out of numerous apps on play store, we are recommending CPU Cooler app for you, download it and apply correctly, then you will see yourself basking in euphoria of happiness for putting an end to your device heating like fire. Tell us your device problem and we would help to provide solution as soon as possible. Do that with the below comment box and ensure to share this post just to educate others about Fixes/solutions and prevention to Android Overheating Problems.